The Melton Valley-SensorNet project has come to Baton Rouge, Louisiana - home to the greatest concentration of chemical refineries, barge traffic and storage facilities in the United States. We showcased our project in conjunction with the Baton Rouge Area Mutual Aid System (BRAMAS) conference to the HazMat chief from Baton Rouge Fire Department, as well as representatives from Army Research Office's Chemical Sciences Division, regional FBI and other first-responder representatives. Oak Ridge National Lab has developed an ingenious sensor mash-up that integrates real-time sensor data with response plans/policies, meteorological data, and predictive models in order to inform First Responders and other decision makers. The sensor package shown above is a chemical sensor developed by SeaCoast Science, Inc. of Carlsbad, Calif. In this video, Magnus Oding of Scan Pacific Northwest, LLC of Mukilteo, Wash. launches the sensor via a pneumatic line thrower along the levee in downtown Baton Rouge. These sensors, when integrated with the communications architecture developed by Oak Ridge National Lab (that correlates space-time information with real-time sensor readings and predictive dispersion models), will provide enhanced situational awareness to any decision maker who has to make high-consequence, time-sensitive decisions to protect people and property. 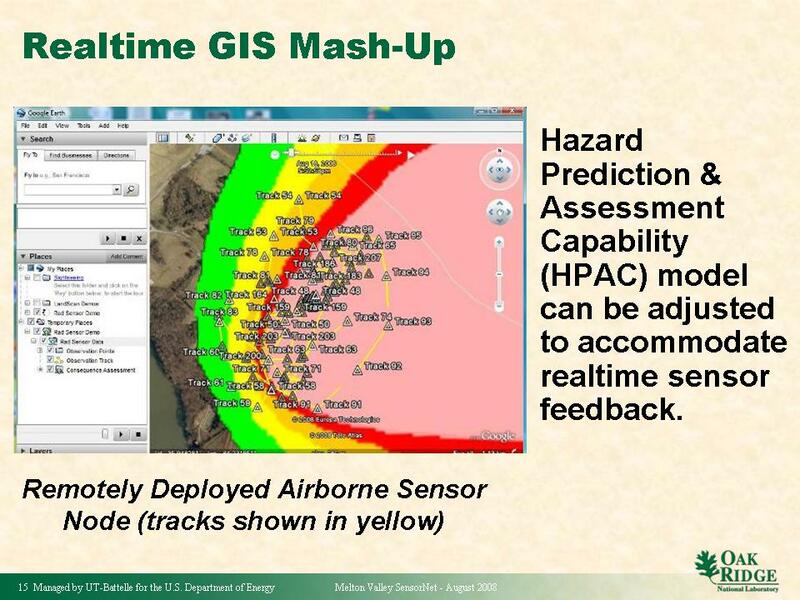 Web 2.0 capabilities merged with sensing capabilities and predictive models create a next-generation "toolbox" for emergency management and disaster response.